1. Review a textbook section on blood vessels. 2. As a review activity, label figures 44.1 and 44.2. 3. Complete Part A of Laboratory Report 44. 4. 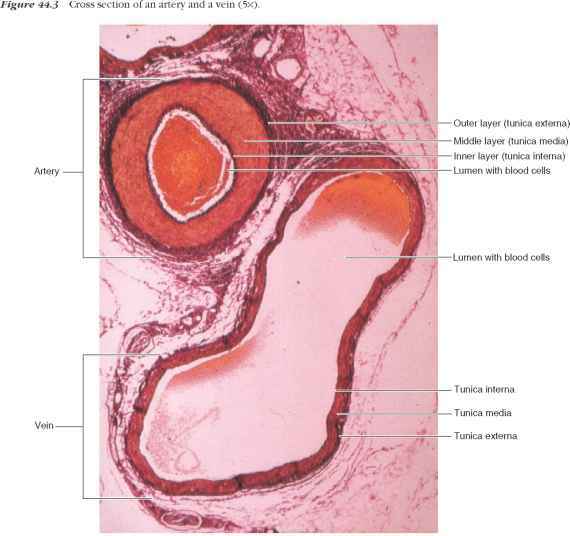 Obtain a microscope slide of an artery cross section and examine it using low-power and high-power magnification. Identify the three distinct layers (tunics) of the arterial wall. 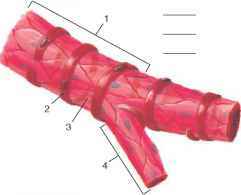 The inner layer (tunica interna), is composed of an endothelium (simple squamous epithelium) and appears as a wavy line due to an abundance of elastic fibers that have recoiled just beneath it. 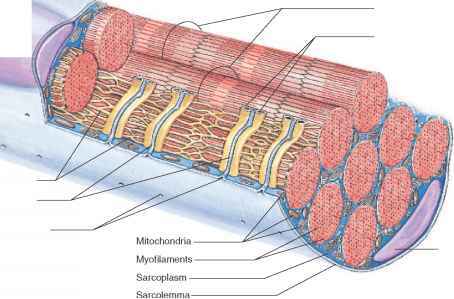 The middle layer (tunica media) consists of numerous concentrically arranged smooth muscle cells with elastic fibers scattered among them. The outer layer (tunica externa) contains connective tissue that is rich in collagenous fibers (fig. 44.3). 5. Prepare a labeled sketch of the arterial wall in Part B of the laboratory report. 6. 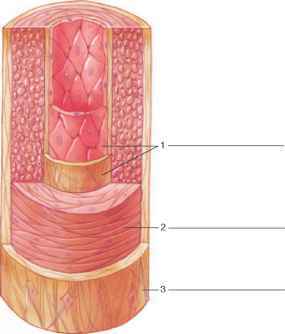 Obtain a slide of a vein cross section and examine it as you did the artery cross section. Note the thinner wall and larger lumen relative to an artery of comparable size. Identify the three layers of the wall and prepare a labeled sketch in Part B of the laboratory report. 7. Complete Part B of the laboratory report. a. Obtain a live frog. Wrap its body in a moist paper towel, leaving one foot extending outward. Secure the towel with rubber bands, but be careful not to wrap the animal so tightly that it could be injured. Try to keep the nostrils exposed. Figure 44.1 Label the tunics of the wall of this artery. Figure 44.2 Label this arteriole by placing the correct numbers in the spaces provided. b. Place the frog on a frog board or on a piece of heavy cardboard with the foot near the hole in one corner. c. Fasten the wrapped body to the board with masking tape. d. Carefully spread the web of the foot over the hole and secure it to the board with dissecting pins and thread (fig. 44.4). Keep the web moist with frog Ringer's solution. e. Secure the board on the stage of a microscope with heavy rubber bands and position it so that the web is beneath the objective lens. f. Focus on the web using low-power magnification and locate some blood vessels. Note the movement of the blood cells and the direction of the blood flow. You might notice that red blood cells of frogs are nucleated. Identify an arteriole, a capillary, and a venule. g. Examine each of these vessels with high-power magnification. I investigate the effect of temperature change on the blood vessels of the frog's foot by flooding the web with a small quantity of ice water. Observe the blood vessels with low-power magnification and note any changes in their diameters or the rate of blood flow. Remove the ice water and replace it with water heated to about 35°C (95°F). Repeat your observations. What do you conclude from this experiment? h. When finished, return the frog to the location indicated by your instructor. The microscope lenses and stage will likely need cleaning after the experiment. 9. Complete Part C of the laboratory report.